On June 10, Electronic Arts is going to host its own panel in front of E3, the popular annual video game conference. Though eight different titles are going to be featured, the one that everybody is buzzing about is Star Wars Battlefront II, the sequel to the 2015 original game. While reception to that game was mediocre at best with many fans pining for a single-player story, ground-to-space fighting, and prequel-era content, EA has promised that this game will appease our voracious Star Wars appetites….and more! In anticipation for the conference, EA has released an image revealing one of the game’s featured prequel-era maps: Naboo’s Theed Palace. To millions of gamers and Star Wars fans, this is for certain something to be excited about. This location is a classic among the prequel films and was a prominent map in the original 2005 Star Wars: Battlefront II. 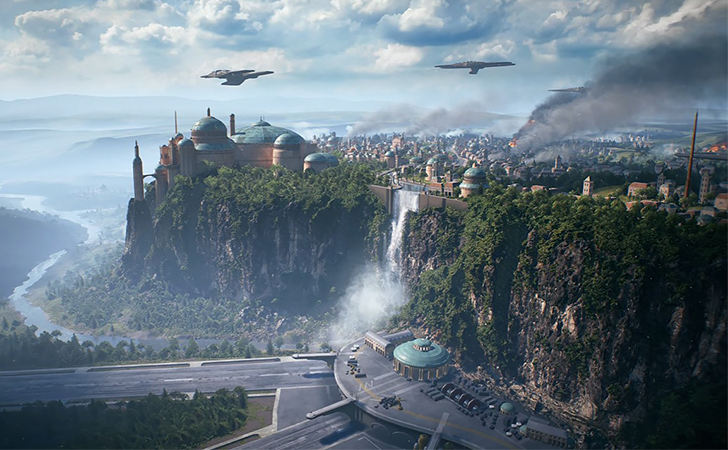 The image promises stunning visuals and cutting-edge graphics and features a Naboo on fire with several CIS Landing Craft vehicles perched atop the city. It’s also possible that we’ll get to see some new bits of Naboo if that landing pad on the bottom is an actual playable part of the map. We’ll learn far more about the game during the livestream this Saturday at 1pm PT.